Sergio carried out his MSc and PhD in Barcelona (Barril Lab), where he worked with different structure-based drug design methods with the aim to improve drug design for non-standard targets. Mainly, he was involved in the development and application of virtual screening approaches using molecular docking and other complementary methods. After finishing his PhD in 2017, he stayed as a postdoctoral researcher in the same lab performing different collaborative projects in the field of epigenetics and cancer, where he could successfully apply the methods developed during his PhD thesis and other experimental and computer-based drug discovery approaches in order to find bioactive compounds targeting “undruggable” proteins. He also carried out two short stays in the labs of Dr Andreas Bender (Cambridge, UK) and Dr Peter Kolb (Marburg, Germany), where he learnt about genomics and other computational methods. 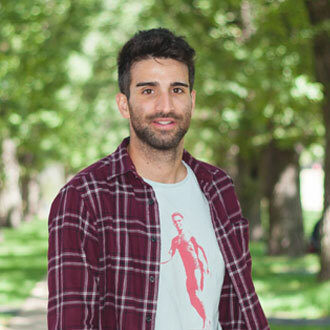 Sergio joined the Baker Institute in January 2019 as a Research Officer in the Systems Genomics lab, under the supervision of Associate Professor Michael Inouye and Dr Agus Salim. His research interests are broad and involve mainly the relationship between genetic variants and their effect on protein structures.